thank you for this very useful application! Is it possible to restart the system more often than once a day? Is there a commercial licence for this app? It's a freeware, from the beginning until now. Is it possible to restart the system 2 (or better 3) times with this app? I think no, for now. Sorry, wise auto shutdown doesn't support multi tasks. I will consider to improve it. Where do you cancel the task from? From Wise AutoShutdown or from Windows task scheduler? My PC is running Win7 Ultimate 64bit with service pack 1 and I cancel the task from Wise AutoShutdown and already uninstall it. Checked in the Windows task scheduler there is no more schedule but the PC still shutdown. schtasks /query /fo table /nh > "%userprofile%\desktop\TasksList.txt"
It probably won't work from a standard profile (Windows user account). At least, it didn't work in my machine (win8.1 x64)... I had to change standard to administrator. Does your PC every shut down in the same time? Do you use the latest v1.49.77? How it happen? When you click the Start button to create the daily task? Or, when you cancel the task? Please tell me more about it. How it happen? When you click the Start button to create the daily task? I.e. : latest version (I was updating all freebies and checking all the translations) and at creation of a daily task. Windows 10 standard (updated from Windows 8/8.1) and DEP (Data Execution Prevention) Always ON. I don't remember if I tried without DEP (in last months). 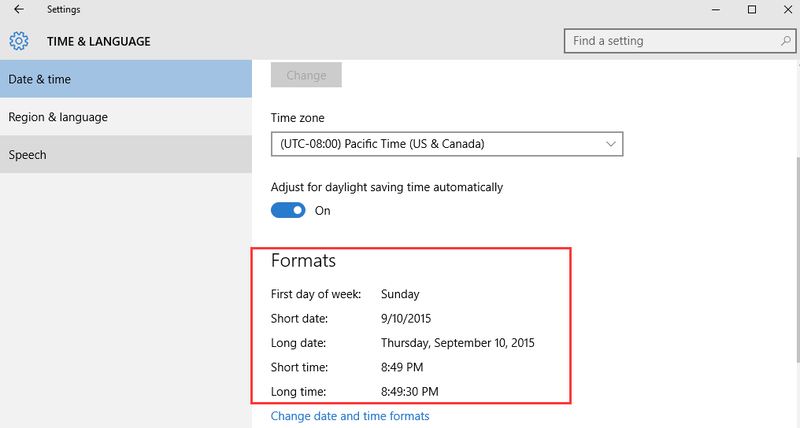 Can you tell me your system Date&Time Formats? All the other tasks work correctly! Anyway, in previous versions, every other tasks worked correctly and the bug was present only on the daily task. 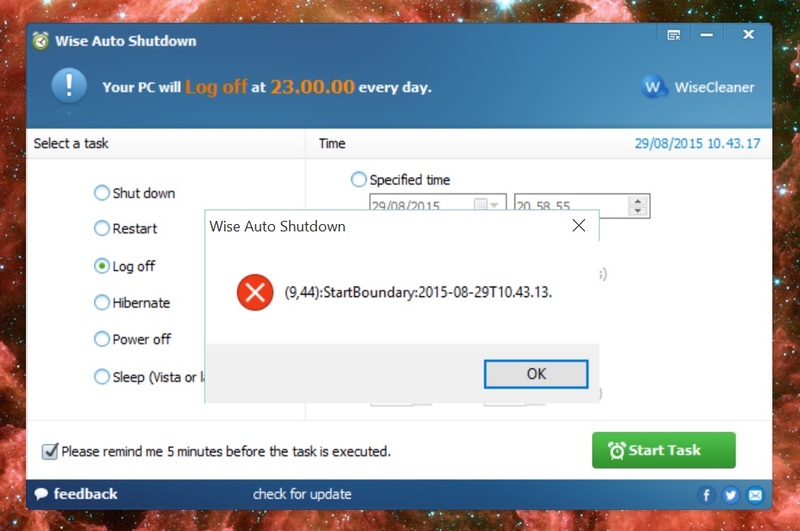 Please try this new version of wise auto shutdown. I forgot to write I'm using the portable version... Anyway I'll try this, of course! - body: wiseautoshutdown.exe has stopped working - a problem caused the program to stop working correctly. Windows will close the program and notify you if a solution is available. Windows 10 standard, Windows firewall, Windows antivirus (defender), WAS version: used yours in your previous post, DEP AlwaysOn, custom scaling level: larger 150% set from Control Panel\Appearance and Personalisation\Display - set a custom scaling level. I have tried now without DEP alwayson (I've set it to optin) and with normal scaling. 1, Computer startup feature at the optional times. Do you means you want setup computer to startup at a specific time? If yes, wise auto shutdown will be defined as Trojans by most antivirus software. So, we can't add this function. 2, Program Interface color skins including Windows color option. Do you means you want to custom the interface color? Ad 1 Your program is not defined as any Virus that is why I do not understand that provided with system start up function will be defined as Trojan. Ad 2 Yes, I mean to custom the program color interface especially to dark background and white fonts like Windows OS High Contrast feature for example. I've been using this product for a few weeks now and it has been running smoothly till date. I only have one suggestion, if it is possible to integrate. You could add a days of the week feature for the daily shutdown menu. Many people might like their PC shutting down automatically during the week if they forgot to shut down manually but would like for it to stay on over the weekend. You know like the alarm function on most smartphones these days. You see, Windows power has 5 status, shutdown, restart, sleep, log off, change log, hibernate. shutdown, sleep and hibernate, all programs will be closed. if you want to start up/ wake up system, you must press Power button or a specific key. A third-party program cannot instead of your fingers. 2, Select Power tab -> Power Up Control, you will see the option Automatic Power Up (or Resume By Alarm), it is Disabled. You can press PageDown, change to Enable, then you will see more options, select Every Day or By Date, when you finish settings, please remember to Save Changes. I don't know your motherboard model, I can't give you details. After your explanation I was convinced that my first suggestion is not suitable.one. It is not possible to apply to your product. But what about my second suggestion? I will appreciate your reply.